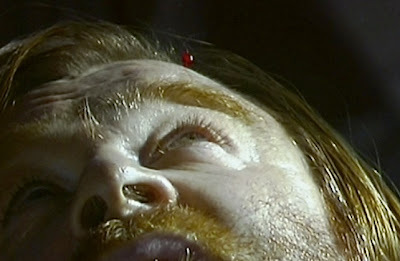 The Horror Digest: 28 Days Later: If Mad-Eye Had Been Wearing His Magical Eye He Would Have Been OK. Just Saying. 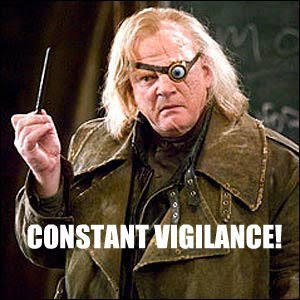 28 Days Later: If Mad-Eye Had Been Wearing His Magical Eye He Would Have Been OK. Just Saying. 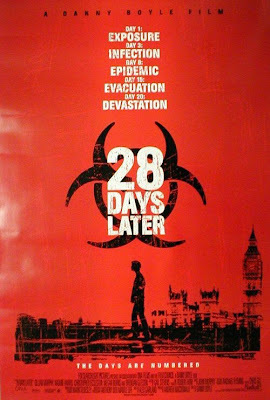 28 Days Later is perhaps my long lost favorite kind of "zombie" movie. I use the term zombie loosely as many people seem to have a problem calling infected people- rather than dead people who have risen again- zombies. And to them I say-- shut up. London in it's post-apocalyptic hey day is one frightening place to be. With the survivor rate being as little as 4 and then later 10- or however many douche bags there were, it is very clear that the good old days of London town are over. Hence the zombie movie motif. So get over it extremist zombie lovers. Here is the plot for the uninformed. An outbreak of a disease dubbed the rage has taken over London. This is the story 28 Days after the initial outbreak. The fears of a society and the type of zombies that exists in the movie usually correlate directly. 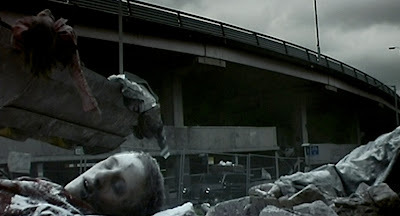 Since the zombies in 28 Days Later are referred to as the "infected" and are actually infected- it is very clear that currently our society is terrified of disease. I love the notion of the infected being infected by the Rage. It's also funny to think about the rage as it's own disease- where aggression is the source of a violent and quickly spreading sickness. Oh the youth today! But what I really love about 28 Days Later is the mere fact that rage exists in us all- as evidenced by Jim's rage at the film's end and his pure blooded passion in killing those that would only make the world an even worse place to be. It certainly mirrors- although in an opposite sort of way, the notion of really only fearing ourselves rather than the zombies. I always love those ideas of the real threat- not being the actual zombies, but something innate in all of us. The army men- when in positions of power are straight up class A douche bags- and Jim uses his own internal, un-mutated RAGE to dispose of them. Yeah. I'm loving that. I also tend to enjoy the astounding horrible and depressingly beautiful imagery that surrounds the film- many inspired by actual photographs in times of war, and revolts. The concept of the film being shot in a much grittier, brutal and honest fashion is pretty genius- and as Danny Boyle says it places you in the movie as an additional survivor, getting a first hand and up close and personal view of the action. Even though Jim/ creepy guy from Red Eye is still creepy- I loved how being in a coma saved him, and how that heart wrenching discovery of his parents- and the note they leave to him on the back of his picture is so perfectly placed. Then we have Selena aka my favorite person in the world. God I love this woman. Her not too publicized back story remains that she was forced to kill both her infected mother and father so that she could save her baby brother- only to find that her brother was also infected- so she has to kill him as well.. It's Pretty obvious then that the girl has some major balls. And if you don't realize that within the first few minutes then God help you. However she's also sensitive- and in the moment of her emotional collapse- you really feel it. And I love that about her. The way that Selena chopped up Mark in the beginning was so unbelievably brutal. Which reminds me of the other reason I love this kind of zombie film- because the presence of guns was kept to a minimum, except of course by those darn douche bags. A machete and a bat as a zombie killing weapon of mass destruction? Heck yes. It once again makes me perk up my CSI trained ears and exclaim at the fact that our main characters are dealing with the infected in a "crime of passion" sense. The burden of killing those infected becomes that much greater- and the very idea of killing someone you love becomes that much more difficult to do, as seen when Jim must kill Frank- (only to be interrupted by those darned douche bags again and their guns!!) The whole concept is just entirely too thrilling to me so I need to rest. OK. Anyways I frickin love this movie. I think some people feel that the beginning is so much better than the end- but I tend to just love it all. Sure things get worse when the douche bags arrive- but that's because they are douche bags. We see so much growth and anguish in the 4 main characters throughout the film- that it really is quite startling. Frank's death was one of those times that I had to fight the tears back- and then the ominous saving by the soldiers and how it just gives you the worst feeling of dread is just nuts. I could on forever just talking about everything I love, but I'm pretty confident in saying that many of you love those same things. So instead lets just smile. Oh no they got Jesus! I friggin' love this movie like there's no tomorrow. Jim turning badass towards the end of the film and going all Rambo after Doctor Who and his Army guys was classic. There's a comic book out now that chronicles Selena's return to London (haven't read it though). Thanks for reviewing one of my favorites as only you can! on another note, i do love this movie. This film is so good. I loved the blood dripping in the eye bit. Have you ever got a rain drop in your eye, or a bit a shampoo? It's a bugger. Being saved from Rage because you were in hospital is very Day of the Triffids, isn't it? It's beautifully shot, with empty London streets you never see in real life. Masterpiece. Completely agree with Scarah there, when I first watched this movie all I could see was Day of the Triffids (the book), but fast moving zombies are way cooler than slow moving, clicking, spitting plans! Your reviews are always so entertaining and spot-on, Andre! Love the "They Got Jesus!" pic and Mad-Eye reference!